What did I picture when I heard the word Africa? Before this summer, the answer would have been simple: poverty and death. I did not see past what I saw on the television—I was too selfish to care. I suppose I would call it an American oblivion to anybody but myself. So, I think it came as a shock to both me and my aunt Kristen when, after a year of discussing the possibility of going to Uganda, we were on a plane headed there for a month.We were both completely amazed by the country itself and how different it was. However, we were both more amazed by the generosity and warmth in every beating heart there. People who are considered to have so little would still give their all to make us happy.Kristen and I were going to be working in Covenant Junior School in Kampala. 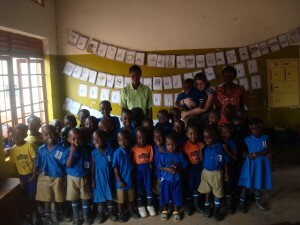 The first day there, we fell in love with the kids. They were so eager for a smile or to be able to touch us. We were just as fascinated with them and how they lived and learned.So, what could we teach these kids? Well, Kristen brought a phonics program (donated by the publisher) to help the kids learn to read. We spent our days teaching the kids from Top Class, P1, and P2 (kindergarten, first and second grade) this program and teaching the kids in P3 and P4 (third and fourth grades) other useful things. It was incredible to see how much the kids liked reading, and how good at it they were when given the chance. However, they are rarely given the opportunity, considering they have very few supplies and almost no books. On the bright side, the teachers continue using the reading program to help the students learn new words and sounds. Now that we have returned home, I believe we would both do anything to see this school prosper.Ironically, we came to teach in Uganda, but were the ones learning life lessons that we will never forget. This entry was posted on Tuesday, December 29th, 2009 at 12:37 pm and is filed under Kampala, Uganda. You can follow any responses to this entry through the RSS 2.0 feed. Both comments and pings are currently closed.